You wanna know the story of my life? The one day (or week, as it were) that I take off blogging, is the day I suddenly have new people wanting to link up with me! I am so excited, and a little embarrassed, that there are so many of you now and I've kinda been dropping the ball the last couple weeks. It's been crazy around here and I've been enjoying being "loosely plugged" for the last couple weeks. I can't say I'm completely unplugged because I'm still OCD with checking my email, but it's been nice to not be glued to the computer all the time. However, just because I'm not 'fessing up today doesn't mean you can't! If you did some confessing this week, I'd love for you to link up here so we can come visit and enjoy the camaraderie that results from hearing you are not the only person in the world who wore a shirt two days in a row, and even slept in it. Not that I did that this week or anything. Gnarly, right? He wasn't even technically riding his bike, he was just standing there in the middle of the street with both feet on the ground, and he turned the wheel too hard and the next thing I know he completely faceplanted on the pavement. Craziest thing ever. It was last night and his eye is totally swelled shut today, so I taught him to say "You think this is bad? You should see the other guy." Anyhoo, I hope you link up with me, my friends, I need some entertainment on my loosely plugged weekend. 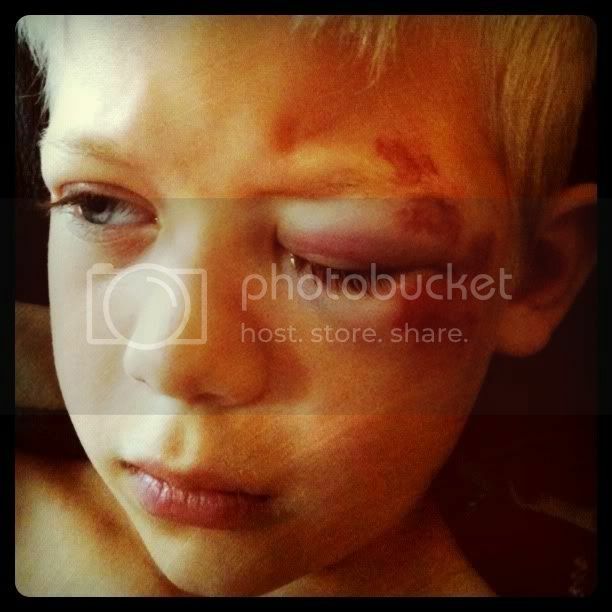 I'm so glad you taught him to say "you should see the other guy". Hope the swelling goes down soon! That poor little guy!!! You crack me upf or teaching him to say that!!!! I love it! OMG Kira! I sure hope he starts feeling better soon. You just help but want to give him lots of hugs. Here's hoping you guys have a less eventful weekend as far as booboo's go. oye! that looks terrible! hope he heals well and FAST! Ouch - being the mommy of a little boys is a tough job. I hope it gets better soon - as always love your post. Have great weekend. oh my goodness! yikes! poor baby! hope he's better soon! Finally figured out how to leave a comment. For 2 years I've been longing to say something, but everytime I logged in, it would take me to my own blogg. Here goes, my confession: your dad and I tried for 30 minutes to get our camper to attach to our pickup. We would roll 'er down, the receiver would hover just over the ball, and go down almost all the way, but would not snap on. We tried everything. I'm down on the ground looking up, your dad is looking down from above, fiddling with the latch, tapping it with a hammer, scratching his head, then roll it up and do it again...finally, a little voice said, walk around the camper. Maybe it's something else. Oh, there it is! We forgot to take one of the jacks out! :D Thank goodness...I thought the camper had a hex on it. Awwww poor thing, I bet that hurt. Hope the swelling goes away fast.